Heat a nonstick skillet, add oil and all vegetables. Saute, stirring occasionally until vegetables are slightly softened. Remove and set aside. Place a piece of parchment or a silicone baking sheet on a cookie sheet. Lay tortillas flat on the cookie sheet. 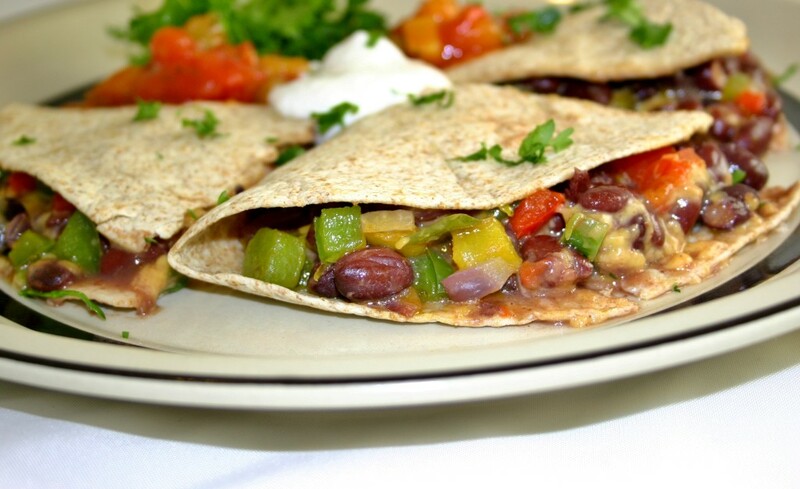 Spread Margaret Holmes Seasoned Black Beans over half of each tortilla. Top the beans with half of the cheese and vegetables. Fold into a half moon shape. Bake for 15 to 20 minutes or until the cheese is melted and the beans are hot. Remove from the oven and cut each tortilla into 2 or 3 pie-shaped wedges. Arrange on a platter and garnish with salsa and fat-free sour cream.